Hi, I’ve been learning about different synthesis methods and synth programming for quite some time now. I have a motif es6 and I was wondering where the oscillator mix parameter is? I want to combine the oscillators. Not just add two elements and detune them. Does anyone know how I’d go about blending two oscillators together, similar to a frequency modulation type of method. I’ve been watching youtube videos with people using older synthesizers and I’ve noticed that they’ll combine waveforms, and often times this can be achieved through the oscillator mix function. I didn’t realize it until last night, when I was looking over manuals and information with my micron. It seems like a simple basic function, I don’t know where it is though. Can someone please help me with this parameter or synthesis function by using the motif es6? Thank you. Motifs don’t come standard with FM capabilities. However, the Classic Motif and ES can use PLG-series plug-in boards. If you already have or can find a PLG150-DX, it will provide FM similar to a DX7. is that none of the motifs? does the montage have fm capabilities? is that none of the motifs? That’s correct. 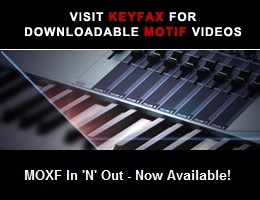 The Motifs are sample playback synths. The samples are in ROM, or with models having User sample memory they can be loaded. Motif FM Voices are sampled. does the montage have fm capabilities?